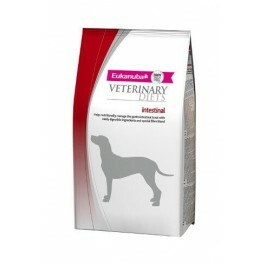 A dietetic complete pet food for dogs, intended as compensation for maldigestion, reduction of acute intestinal absorptive disorders during periods of and recovery from acute diarrhoea and regulation of lipid metabolism in case of hyperlipidaemia. Intestinal contains highly digestible ingredients, an increased level of electrolytes, a low level of fat and a high level of essential fatty acids. Contains a natural fibre blend, including beet pulp, MOS and the prebiotics FOS. This formula helps support the natural balance of the intestinal microflora and helps optimize nutrient absorption. Intestinal is also intended for the regulation of lipid (fat) metabolism in the case of hyperlipidaemia (high blood fat). It is recommended that a veterinarian's opinion be sought before and during the use of this product in order to determine the needs of your dog. Dogs can be fed for 1-2 weeks for acute intestinal disorders , initially up to 2 months for regulation of lipid (fat) metabolism, or 3 to 12 weeks as a compensation for maldigestion, or for a lifetime in cases of chronic pancreatic insufficiency. For any extended use we recommned that you please consult your veterinarian. In addition, this diet will provide all the nutrients needed to support the overall health and well-being of your dog. A wet version of this diet is also available. Feeding Instructions: It is recommended that a veterinarian's opinion be sought before use or before extending the period of use. Your veterinarian may suggest specific feeding instructions for your dog, or ask you to follow the standard portions shown in the feeding chart. Recommended time for use: compensation for maldigestion: 3-12 weeks, but lifetime in case of chronic pancreatic insufficiency; reduction of acute intestinal absorptive disorders: 1-2 weeks; regulation of lipid metabolism: initially up to 2 months. Water should be available at all times for your dog to drink.